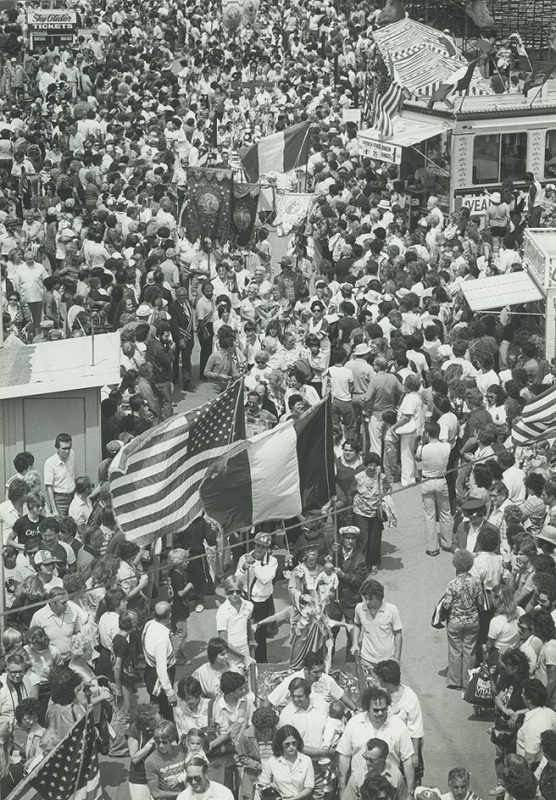 Festa Italiana, held annually since 1978, represented the first of Milwaukee’s modern ethnic festivals and an effort to recapture the spirit of a vanishing community. In the 1960s, Milwaukee’s urban renewal plans led to the demolition of Our Blessed Virgin of Pompeii Church in Milwaukee’s Third Ward. By the time the little pink church had given way to freeway construction, most of the area’s Italian-American residents had fled to the suburbs. Neighborhood and civic leaders, along interests in re-creating the religious and street festivals from the community’s summers prompted organizers to establish the Festa Italiana in 1978, an event that also marked a larger movement to embrace Milwaukee’s diversity and potentially ease ethnic tensions. Held at the adjacent Henry W. Maier Festival Park on the lakefront, the multi-day celebration became a summertime institution, with attendance numbers typically well over 100,000. With the little pink church that served as center of the community’s sacred and social festival long since gone—though the site did serve as a pilgrimage in Festa’s early years—music, food, and cultural activities instead anchor the community gathering. Opera, accordions, and strolling musicians serenade the crowds while more mainstream bands round out the soundscape of the occasion. Organizers also strived to re-create the aesthetic of an authentic urban community with a replica piazza, surrounded by the façades of Italian-style buildings. The space serves as a cultural area with photo and art exhibits that chronicle the Italian experience in Milwaukee. Bocce ball courts, gondola rides, and Italian cuisine also help draw thousands every July. ^ Joseph A. Rodriguez, Bootstrap New Urbanism: Design, Race, and Redevelopment in Milwaukee (Lanham, MD: Lexington Books, 2014), 80-85. ^ Rodriguez, Bootstrap New Urbanism, 80-87. ^ Thomas Heinen, “Festa Italiana: Music, Food, Fun,” The Milwaukee Journal, July 28, 1978, accessed March 23, 2015, http://news.google.com/newspapers?nid=1499&dat=19780728&id=TVwaAAAAIBAJ&sjid=sCkEAAAAIBAJ&pg=4096,4242034; Rodriguez, Bootstrap New Urbanism, 80-81. Rodriguez also notes that Festa Italiana, along with the other modern ethnic festivals, also came into existence so as to offer cultural and entertainment options for an older demographic than those provided by Summerfest. ^“Festa Italiana Reports Rise in Attendance,” The Milwaukee Journal, July 18, 1993, accessed March 20, 2015, https://news.google.com/newspapers?nid=1499&dat=19930718&id=OqIaAAAAIBAJ&sjid=qSwEAAAAIBAJ&pg=1393,3210433&hl=en; Felicia Thomas-Lynn, “Fests Diverge at Bottom Line,” Milwaukee Journal Sentinel, June 23, 2006, accessed March 19, 2014, https://news.google.com/newspapers?nid=1683&dat=20060623&id=iScqAAAAIBAJ&sjid=LUUEAAAAIBAJ&pg=3829,2026996&hl=en; “Family Focus Adds to Festa Attendance,” Milwaukee Business Journal, July 21, 2009, accessed March 30, 2014. ^ Rodriguez, Bootstrap New Urbanism, 86. Later, Festa organizers erected an exhibit of the church. See Cultural Area, Festa Italiana website, http://festaitaliana.com/activities/cultural-area/, accessed March 2014, information now available at Arts & Culture, Festa Italiana website, accessed May 4, 2017. ^ Thomas Heinen, “Festa Italiana: Music, Food, Fun;” C.E. Hanifin, “Festa Italiana Puts a Pinch of New in Old,” Milwaukee Journal Sentinel, July 18, 1997, accessed May 1, 2014, https://news.google.com/newspapers?nid=1683&dat=19970718&id=QqQaAAAAIBAJ&sjid=NC4EAAAAIBAJ&pg=4416,3330394&hl=en; see also Entertainment Schedule, Festa Italiana website, last accessed May 4, 2017. ^ Milwaukee Magazine Staff, “Festa Italiana Turns 35,” Milwaukee Magazine, July 16, 2012 http://www.milwaukeemag.com/article/7162012-FestaItalianaTurns35, accessed March 15, 2015; Eva Simonich, “Festa Italiana Adds More Pizzazz to ‘Really Beautiful’ Piazza,” Milwaukee Journal Sentinel, July 19, 2002, accessed April 2, 2015, https://news.google.com/newspapers?nid=1683&dat=20020719&id=ZakaAAAAIBAJ&sjid=PUUEAAAAIBAJ&pg=1696,6762270&hl=en. ^ Tim Pratt, “Pasta Is Prologue,” The Milwaukee Journal, July 10, 1992, accessed April 10, 2015, https://news.google.com/newspapers?nid=1499&dat=19920710&id=C-YdAAAAIBAJ&sjid=hywEAAAAIBAJ&pg=6784,1366420&hl=en; Thomas Heinen, “Festa Italiana: Music, Food, Fun”; C.E. Hanifin, “Festa Italiana Puts a Pinch of New in Old;” Heather Ronaldson, “Gondola Rides Available This Weekend at Festa,” Jsonline.com, July 19, 2013, accessed April 14, 2015.